It shows the limits of party politics—and the necessity of social movements to challenge those limits. On July 1, the Democratic Party released its draft platform, a document which will go before the full platform committee on July 8-9, before being debated at the Democratic Party Convention in Philadelphia at the end of this month. The 35-page draft reminds us of two crucial realities: the limits of party politics while corporate and military interests dominate both parties, and, crucially, the necessity of social movements to challenge those limits and—sometimes—to win. The sections of the platform on Wall Street and tax reforms, in particular, are much bolder than those in the 2012. But it does show that committed and strategic movements can have impact. The sections of the platform on Wall Street and tax reforms, in particular, are much bolder than those in the 2012 draft. For example, the new draft expresses support for “a financial transactions tax on Wall Street to curb excessive speculation and high-frequency trading, which has threatened financial markets.” This idea of a small tax to curb financial speculation while generating funds for job creation, climate programs, and other social needs was still on the political margins in 2012. And yet on other key issues—most notably the Trans-Pacific Partnership—even a strong and militant trade-union-led opposition, backed by a host of civil-society organizations and even key Democratic Party figures, was unable to achieve its goal. While Bernie Sanders strongly opposes the corporate-empowering TPP, and even longtime “free trade” backer Hillary Clinton moved to reluctantly and tentatively oppose the agreement, the Democratic leadership was unwilling to directly challenge President Obama in the platform. The language instead is limited to the acknowledgment that there is a “diversity of opinion” in the party on the TPP. But it is on the platform’s dealing with issues of war and peace, militarism and diplomacy, Palestine and Israel, that both the potential and the limitations of social movements are most clear. Discussion of today’s US wars—with thousands of ground troops, warplanes and pilots, drone bombers, special forces, CIA paramilitaries, and so many more now actively at war in Afghanistan, Iraq, Syria, Yemen, Libya, and beyond, with thousands dying and millions displaced, with hundreds of billions of dollars squandered on these wars—was virtually absent during the platform debates. The foreign-policy section overall—the last seven or eight pages of the draft presented to the platform committee for their consideration—maintained a strong focus on US military power. Parts of it struck a defensive tone, seemingly aimed at asserting military toughness both to contest the (long expired) view of the Democratic Party as “soft on the use of force,” and to challenge Donald Trump’s bellicose (though often quite isolationist) language. During the lengthy public sessions of the drafting committee, little attention focused on the broad issues of the war on terror, Syria and Iraq, the drone war, US backing of the Saudi war against Yemen, or other critical war and peace discussions. The longstanding efforts of California Congresswoman Barbara Lee, a member of the drafting committee, to force Congress to debate the 2001 Authorization for the Use of Military Force (AUMF) led only to a call for the Democrats to “seek an updated Congressional AUMF that is more precise about our efforts to defeat ISIS.” It said nothing about including a sunset provision, let alone including limits on geographic area and identified enemies such an authorization would need to avoid the reliance on it by future presidents seeking to expand their theater of war. And while calling for a new AUMF that “does not involve large-scale combat deployment of American troops,” it did not prohibit such deployment, nor did it even hint at the possibility that it was precisely the occupation of Iraq by American troops that set the stage for the creation of ISIS. The draft asserts that the United States “must continue to have the strongest military in the world” and criticizes the “arbitrary cuts that the Republican Congress enacted as part of sequestration.” It makes no reference to actually reducing the military budget. We are told that as Democrats “look beyond the wars in Iraq and Afghanistan and the conclusion of long-term nation-building with large military footprints, we will continue to get rid of outdated Cold War–era systems and ensure our security with a more agile and flexible force.” Except for the inconvenient problem that the wars in Iraq and Afghanistan, not to mention Syria, Yemen, and soon-to-be-escalated Libya, are still raging, thus “looking beyond” those wars is more than a bit premature. So in the meantime, apparently, the military budget remains. The overall language, despite the claim that “war is the last resort,” focuses on highly militarized responses. On Iran, the platform draft includes reluctant support for the nuclear deal, focusing on the need for vigorous enforcement and asserting that Democrats “will not hesitate to take military action if Iran violates the agreement.” It claims Iran is “the leading state sponsor of terrorism,” ignoring the widely acknowledged role of Saudi Arabia in funding and enabling extremist forces, and claims that Iran “has its fingerprints on almost every conflict in the Middle East,” ignoring again that in places like Iraq and Afghanistan, Iran just happens to be on the same meddling side as Washington. Sadly, the bellicose language reflects no hope for building toward a new relationship with Tehran. The overall language, despite the claim that “war is the last resort,” focuses on highly militarized responses. The terrorism section, which starts with “we must defeat ISIS, al-Qaeda and their affiliates…” goes on to speak of a coalition to “destroy ISIS’ stronghold in Iraq and Syria,” and pressing other countries to “carry their weight in prosecuting this fight.” It goes on to describe dismantling the terror networks and “harden[ing] our defenses at home.” Nowhere is there any reference to recognizing, let alone trying to change, the conditions that have led to so many people in Iraq and Syria—or in Belgium and France and elsewhere—turning to ISIS in response to decades of dispossession, hopelessness, disempowerment, and more. Nowhere is there any hint of acknowledgment of the stark reality that the military attacks aimed at “destroying ISIS strongholds” are resulting in more civilian casualties and destruction of cities and thus more people turning to terrorism, and that ISIS’s loss of territory has led the extremist organization to return to its earlier iterations of carrying out and inspiring terror attacks against Middle Eastern, Western, and other international targets. So the Democratic Party platform essentially calls for a continuation of a failed anti-ISIS strategy that most closely resembles Whack-A-Mole. It is not surprising, perhaps, that the platform committee accepted such language, given the scant public attention to the issues of war and militarism. These issues should be a broadly unifying set of concerns for progressives; it wasn’t Sanders’s campaign issue, unfortunately, and obviously it wasn’t Clinton’s, who continues to cheerlead for escalation in virtually all the US wars. But it should have been our issue—a key issue for all the social movements. But the self-defined anti-war movement is in a weakened state these days, and not enough of us took up work on that question. An anti-war position, in the broadest sense of reducing military budgets, calling for diplomacy over war, condemning the “inevitable” civilian casualties, calling out how military assaults create rather than end terrorism…these are enormously unifying principles among progressives. It certainly should have been a much bigger part of what progressives pushed for in the platform fight. This is one of those irrefutable examples of why movements matter, and what happens when they are weak. Then there’s the question of Palestine. And that provides us with another, much better example of why movements matter, as well as another example of how even expanding, creative, global movements are sometimes not yet enough. The US wars were hardly mentioned, but Israel-Palestine, for so long excluded from any mainstream debate, was a major focus of the committee’s public hearings. Pro-Israel lobbies and Clinton’s support for Israeli occupation and apartheid stymied a progressive position on Palestine. The reason is easy to see. The movement to end US support for Israeli occupation and apartheid and to support Palestinian rights is at this moment probably the only part of the broad anti-war/anti-militarism movement that is really on the rise. It’s energetic, empowered, creative, and grounded largely among young people, many of them people of color. It’s had enormous successes in recent years, resulting in massive shifts in public discourse on this issue. 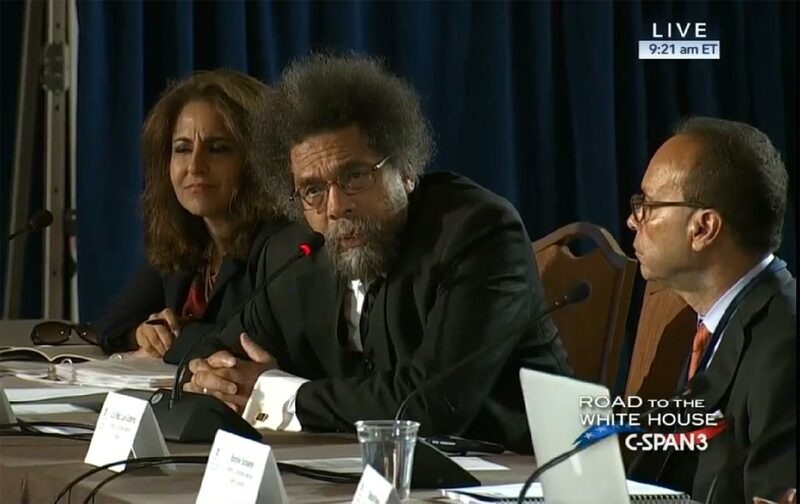 The strength of that movement is certainly a large part of the reason that Bernie Sanders chose Jim Zogby and Cornel West, longtime supporters of Palestinian rights, among his appointees to the platform committee. Their presence on the committee, reflecting the Palestinian rights movement outside, transformed the debate. The success of the movement, and the presence of West and Zogby on the platform committee, resulted in a huge reversal of position, in which the issues of Palestinian rights, Israeli violations of international law, and the problems caused by US support for Israel were all central and mainstream discussion points. So even though plenty of people inside the DC bubble either ignore or are unaware of the shift in public discourse, and apparently still believe that criticizing Israel constitutes political suicide, Palestinian rights and the need to change US support for Israel, were in the platform debate—because there was a powerful movement demanding it. The broad opposition to UN efforts to identify and condemn Israel’s violations of human rights and international law is an outrage for a party that claims, elsewhere in the platform, to “believe that global institutions and multilateral organizations have a powerful role to play” (even if they go on to define them narrowly as “an important amplifier of American strength and influence”). The specific condemnation of BDS reflects, on the one hand, the growing influence of the global BDS movement in the United States. The movement, based on a call from Palestinian civil society in 2005, brings nonviolent economic, cultural, and academic pressure to bear on Israel until it ends three sets of violations of international law: the 1967 occupation, the discrimination against Palestinians inside Israel, and the denial of the Palestinian refugees’ right of return. The movement is growing around the world and is particularly strong in Europe, and the result has been recognition by many Israeli officials and analysts that it is this nonviolent movement, much more than the threat of military attack from Iran or anywhere else, that threatens Israel by undermining the legitimacy of its actions. But the rising power of BDS has led to a harsh backlash from Israel’s supporters, and the inclusion of a specific anti-BDS reference in the platform reflects the power of uncritically pro-Israel forces in the Democratic Party and points to the increasing repression facing BDS activists across the United States and around the world. As governments give in to pressure from pro-Israel forces to stamp out BDS, the result is a serious threat to First Amendment rights in places like New York and other states and on college campuses across the United States. Despite the terrible language, though, it’s still an important victory that the issue of Palestine and Palestinian rights played such a central public role in the debate over platform language. It’s a lesson for those of us who work in the Palestine and broader anti-war movements for sure, but for all of our movements too. It shows us how the lack of our attention—movement attention—and reliance solely on elected officials’ own priority choices mean that way too many of our issues will continue to be ignored. But it also shows us how a powerful movement—even one that has not yet succeeded at changing actual policy—can have enormous influence on the debates at the highest levels of power. Bernie Sanders’s campaign certainly played a part in it—but it’s our movements that matter most.